Vick signed with the Eagles. Why is it that trouble seems to always find a Weigh Station at the NFC East? Very smart by the Eagles to give this guy a ONE year deal. He is not the alpha male, he is a player trying to help his team, and (pun intended) he is on a short leash. It is not entirely clear how much playing time he will get in 2009, given his need to get in game-playing condition, his need to learn the playbook, the suspension issues etc.. Positive comments from Coughlin on Sintim. “Working with the 1’s.” Not so positive remarks on the offense as a whole. Is it me, or is ALMOST EVERY YEAR the defense ahead of the offense? Kiwanuka– to be fair, this season he has the luxury of training camp AT HIS POSITION. So we like the upside. He’s been able to make an impact. It has not been consistent. But this year he’ll be busy. Sheridan is going to enable him to get good matchups on pass rushing, so we see no reason why he can’t have a very good year. Coughlin had some very good things to say about him. At this point Hagan seems to have an inside track to make the roster. If he plays in preseason as well as he is practicing, do the Giants keep 7 WRs? We’ve got some time before that question arises, but we knew there were roster issues at WR a while ago. Still have them. If these three second year players can make that leap and not only contribute but also make impact plays, then this defense can be formidable. The DL is looking to dominate, so you want to have the guys behind them clean up and feast off of the opptys. 1) We heard from players and coaches in the aftermath of the game with the skins that it wasn’t just routinely 8 men in the box. There were times it was 9, even 10 men in the box. 2) Details of how Burress tried to cover up the incident. Here is the problem- you make one mistake by carrying an unlicensed gun. Since there is no harm intended, your first mistake, no criminal record, you can TRY to look past that. But when you start trying to cover up, bribing hospital workers, having friends take away evidence, it is the cover up. Ask Martha Stewart how much time she would have served if she came clean. ZERO. She would never have been charged with anything. DA’s hate obstruction of justice, they don’t like the cover up one bit. 3) Giants weighing options. Oh, joy. 4) A local group of my alma mater has scheduled their holiday party at 1PM-5PM on Sunday December 7th. Aren’t any of them Giants fans? 5) Wonder asks aloud, how can it be that Revis and Rhodes are that gifted and yet the defense can be so woeful vs the Broncos? Answer- poor defensive schemes. Message-we take for granted the answers Spags has every weekend. 6) Speaking about taking things for granted, ever notice how the defense does not miss tackles?! Phillips, for one, is the hoover vacuum cleaner. Limiting those yards after catch is why our defense keeps us in games, bending but not breaking. One of the best parts of that 5 set DVD of the 2007 season was hearing Strahan’s voiceover of the Super Bowl (of which, even my WIFE enjoyed!). One of the most revealing remarks he made was how the coaches preached (in preparation for the game) how important it was to do the ORDINARY. How making the tackle was so ordinary yet so important. This 2008 team is paying attention to detail and doing the ordinary. Not a complete surprise, but if you do the ordinary well for an entire season you end up with something extraordinary. 7) Did you see the hit put on Wes Welker by former NY Giant Ryan Clark in Sunday’s game between the Steelers and Patriots? Those of you reading this blog know we do not cheer, highlight or advocate the violent side of this game… with that qualifying remark stated, I confess to thoroughly enjoying seeing Welker get popped. Like they state in the article, “it wasn’t dirty, it was football.” Going over the middle subjects you to that risk. It still frustrates me to no end to watch that little piece of brown avoid and maneuver through there without any consequences. All I can say is the truth, that I got a tremendous amount of satisfaction from seeing someone finally nail that guy. 9) The Giants are -8.5 vs the Eagles. What is so impressive (or weak, depending on your perspective) about the handicapping is that you have to remember it was only ~3 weeks ago the Giants were +3 at the Linc. So what does that say? Under normal circumstances, the Gmen would be -3, since a FG is the difference between a neutral field and home (6 pts difference between home and away). For the line to move another 5.5 points is staggering. Considering how the Eagles manhandled the Cardinals, my interpretation is that it says more about the Giants getting their business done than anything else. They are 10-2 versus the spread this season. 10) When the defense shows 8 men in the box, I would throw it 100% of the time. If they have 6 men in the box, I would run it 100% of the time. Obviously those numbers are slight hyperbole. But you get the idea. You must punish these teams if they want to take away the run. Brown them where they breathe. 9 men, 10 men in the box? They are overcompensating for our rushing attack in such a bad way. Gilbride is not all the way there yet, but he sure has come a long way from the Bengal game. He had Manning passing plenty, and with a lot of success, and then those dumpoff slip screens right behind the box, pretty. To illustrate how far Gilbride has come this season, there is NO WAY he calls the slant to Hixon (on 1st and 10 from the 3 after the INT by Ross) in the Bengal game, and probably not vs the Steelers either. A run on that play gets two yards MAX, they were loaded in there like sardines. Absolutely fantastic call. Worth the price of admission. 11) Pierce does not see himself getting arrested. Meat and potatoes win. Yes Wonder, the Redskins stink. They are learning a new system, their offense is woeful and they have a lot of injuries. Their two minute offense wouldn’t scare a college team. It is not who you play but when you play them. They will get a lot better- every team improves from W1 to W17. Offense: Manning was not present for all 4 quarters, but he looked good. He used the pump fake and looked off the safety on more than a few occasions, which was vg. Burress was excellent. Steve Smith picked up right where he left off with his terrific 3rd down possession catches which kept moving the sticks. Jacobs was punishing… he always looks good at the beginning of the season when he has fresh legs. Ward looked very good too… and as good as we have ever seen him catching the ball out of the backfield. When Jacobs has fresh legs it is hard to argue for Bradshaw. With the exception of a pass or two out of the backfield that screamed for #44, any of the three of them could get this job done. John Madden was having a lovefest with the offensive line.. I was surprised he did not suit up to join them down there. Great play call by Gilbride on the naked bootleg at the 1 yard line. As we mentioned in preseason, Manning should run ONCE per game just to keep the defense off-balance. Specials: Not good, folks. No hang time on kickoffs gives them good field position. 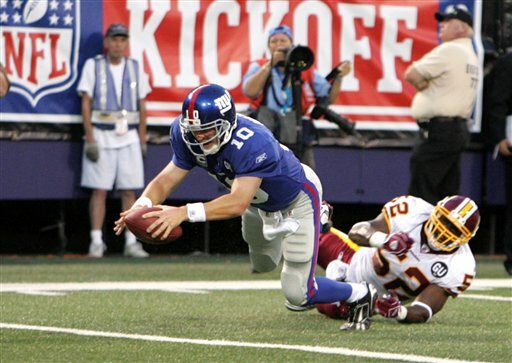 Carney will work until Tynes can come back. Costly roughing the kicker by McDougle was a turnover insanity. Okay, okay. I promised myself I would not get too excited. Sorry, I am excited. Kenny Phillips has a few people gushing, and they are the right ones. No, this was no puff piece. The coach took the time to tell everyone he is still a rookie, he is not a starter, he has not been anointed, he still makes his mistakes. But this sounds real good, coming from a coach and a veteran on the other side of the ball. This is EXACTLY what you want to hear. 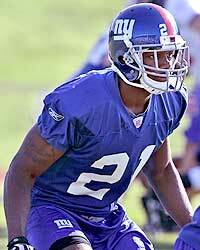 New York Giants sign Kenny Phillips. Now all the Giants need to do is get Plax in camp and this will be one happy family for preseason. You are currently browsing the archives for the Kenny Phillips category.